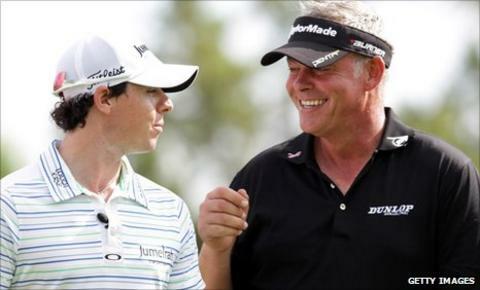 Golfers Darren Clarke and Rory McIlroy have received awards for their 2011 success in the New Year Honours list. becomes an OBE while fellow Northern Irishman McIlroy is appointed an MBE for his win. Taekwondo world champion Sarah Stevenson and rugby union players Chris Paterson of Scotland and Wales' Martyn Williams all become MBEs. Ex-Aston Villa chairman Doug Ellis is made a knight, while former cricket umpire Dickie Bird is appointed an OBE. Former Formula 1 champion Nigel Mansell also becomes a CBE for services to young people as President of UK Youth and veteran BBC broadcaster Stuart Hall receives an OBE, while England rugby league captain and Grand Final-winning Leeds Rhinos prop forward Jamie Peacock becomes an MBE. Racing car designer Adrian Newey, chief technical officer at the world champion Red Bull Formula 1 team, whose previous designs include the Williams car in which Mansell won the world title, is made OBE. Golfer Clarke, 42, fired a final-round 70 at Royal St George's in July to finish five under par and hold off Americans Phil Mickelson and Dustin Johnson. McIlroy, 22, won the US Open in Washington in June and climbed to number three in the world rankings. He became the youngest US Open champion since Bobby Jones in 1923, who was just 21, and the youngest major winner since Tiger Woods triumphed at the Masters in 1997 while 21. McIlroy was "humbled" to be on the list and said: "Many people on the honours list have made huge personal sacrifices and contributed significantly to society during their lives. I feel very fortunate to be in their company." Clarke and McIlroy were both nominated for the BBC Sports Personality of the Year award, with Clarke coming second to cyclist Mark Cavendish. Stevenson, 28, won gold at the Taekwondo World Championships in Korea in May, just months after taking a break from the sport to care for her parents, who were diagnosed with terminal conditions in January. Her father Roy and mother Diana lost their battles with cancer before the end of the year, but Stevenson was honoured for her inspirational achievements by being named the Sunday Times Sportswoman of the Year. "It is such a huge honour to receive an MBE and it's fantastic to be recognised for the hard work I have put into taekwondo for the past 21 years," she said. "I know my parents would have been so proud of this award." Paterson, 33, quit rugby in December after a glorious career in which he became Scotland's record cap holder with 109, record points scorer with 809, and appeared in four Rugby World Cups. "To be recognised in this way for doing something you love to do is a wee bit strange but it will be a nice reminder of what I've achieved in both club and international rugby," he said. Williams is the most capped forward in Wales history, but is stuck on 99 appearances after being omitted from the Welsh squad for the 2011 Rugby World Cup in New Zealand. Also appointed CBEs are professor Sarah Springman for services to triathlon, and Giles Clarke, chair of the England and Wales Cricket Board. Former horse racing trainer Peter Walwyn becomes an MBE, while former dual-code rugby international Bev Risman, 74, and record-breaking greyhound racing trainer Charlie Lister, 71, are both appointed OBE. Candidates linked to the 2012 Olympics and Paralympics have also been recognised with knighthoods for Charles Allen and John Armitt, who are both on the organising committee. And Graham Henry, the former Wales coach who led New Zealand to victory in the 2011 Rugby World Cup, was made a Knight Companion of the New Zealand Order of Merit for his services to the sport. The Football League's chief operating officer, Andy Williamson, 58, has been awarded an OBE after 40 years of unbroken service with the organisation.